Elaine originally qualified as a Building Surveyor and was employed by the Percy Thomas Partnership. She later worked on the supervision of the refurbishment of properties in Mayfair, London. This work was followed by a career break to start a family. Whilst her two sons were young she continued her interest in the built environment by studying for an honours degree in the history of art and architecture. 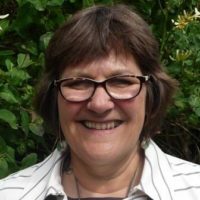 She has held officer positions in various heritage societies including Chair of the Victorian Society Wales group since 2000, and also area Chair of West Mercia NADFAS (which includes South Wales) since 2012, having served in various officer roles since 1996. She served as a trustee of both Ruperra Castle Preservation Trust and Ruperra Conservation Trust, and is an active committee member of the Welsh Historic Gardens Trust and Cardiff Civic Society. These roles involve, apart from management skills, campaigning and commenting on planning applications, appraisals and development plans in Cardiff and parts of Wales, or sometimes being involved in design decisions, as a result of which Elaine has close contacts with RCAHMW and Cadw. Elaine regularly sets up annual programmes of lectures, conferences, study weekends and visits abroad. She has been involved in a number of heritage projects including accessioning a complete archive for the National Museum of Wales and guiding several exhibitions, plus the recording and stabilisation of the Picton Castle Library books and ‘moth-balling’ the QDG museum contents. Elaine’s research has strengthened her resolve to help sustain our cultural heritage and diversity. She is passionate about widening access to our cultural heritage and conserving this heritage for future generations, as a resource and inspiration to aid social cohesion. She believes that places come alive when peopled by stories and can transform lives. During the period of completing her PhD with the Cardiff School of Planning and Geography at Cardiff University she undertook teaching duties at the School. Elaine’s thesis covered the work of the Percy Thomas Partnership in the ‘building’ of modern urban Wales. This has involved detailed research on the development of the political and architectural history of Wales and beyond.